Randomly changing ownership and names when it comes to Chinese restaurants is nothing new in the Lower Mainland. In fact, if a Chinese restaurant maintains the same ownership and/or name for more than 5 years, it is somewhat of an accomplishment. Of course, there are many reasons for this, including tax implications and unofficial bankruptcies. 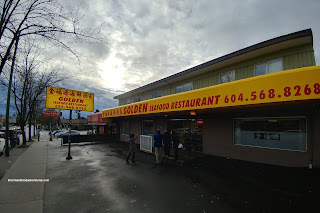 One particular spot has had some stability in long stretches, but has gone from Golden Phoenix, East Ocean, Phoenix Garden and now its current iteration, Golden Restaurant. I checked out the place with the in-laws recently where I could hear the Mother-in-Law from the back door as I was entering the place... (sigh...). 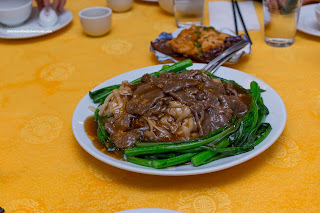 Interestingly, my MIL insisted on ordering the Flat Rice Noodles with sliced beef and yau choy. Normally, we choose the dry wok-fried version, but this saucy version turned out to be pretty good. Who knew? MIL makes a good decision... 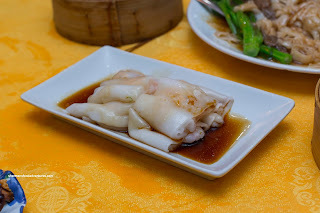 There was a substantial amount of soft, yet not melting, rice noodles topped with a mild-tasting starch-thickened sauce. The beef was generally tender, except for a few that were sinewy. Next, the Eggplant stuffed with shrimp mousse was also on point. Naturally, the eggplant itself was soft. On the other hand, it wasn't mush either. The best part of the dish was the shrimp mousse as it was light, bouncy and almost juicy. It was well-seasoned while still exhibiting natural shrimp aroma. I found the sauce to be a bit weak though. Probably the worst dish of the meal arrived pretty early in the Steamed Bible Tripe with ginger. Portion-wise and taste-wise, there was actually nothing amiss. In fact, the ginger really came through and they didn't overload it with sodium. The biggest issue was the tripe itself as it was far too soft. Therefore, the desired chewiness or bite of the tripe was completely missing. 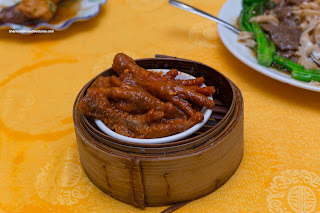 Although a bit scrawny-looking, the Phoenix Talons (Chicken Feet) were actually good. They may have been a touch overdone, yet the texture of the fried skin and the cartilage underneath were soft without completely falling apart. With just enough sauce (not that goopy stuff), the garlickiness along with sweetness was balanced. Onto the Rice Noodle Rolls, we got both the shrimp and the salty donut. I thought the rice noodle itself was on the thicker side, hence it ate a bite heavier. However, it wasn't as if it didn't have a nice texture either. In fact, it was still delicate with some elasticity. The shrimp were fairly large in size and were texturally on point with a meaty snap. 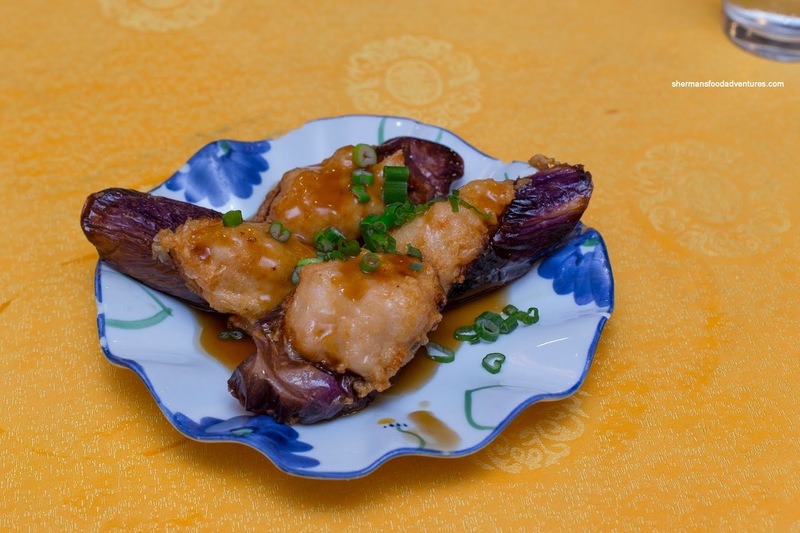 Much like the stuffed eggplant, the shrimp was flavourful including the natural aroma. 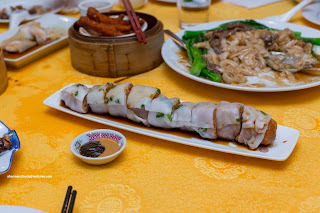 As for the donut rice noodle roll, the noodle was a touch thinner. That could've been the result of less folds as well. Inside, the donut was too dense for our liking. Thus, the roll ate pretty heavy. It was lightly crispy and not greasy though. 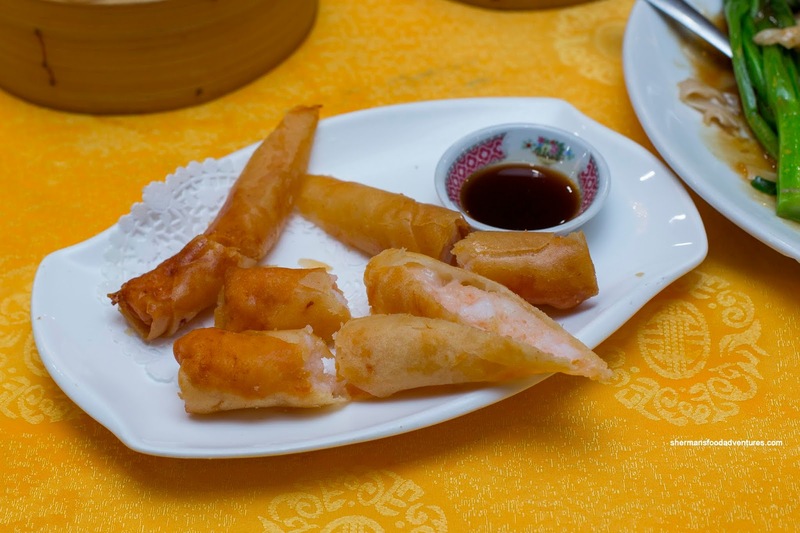 For some odd reason, my MIL thought that the outside of the Shrimp Spring Rolls were salty. Um... They don't season the outside of spring rolls... Anyways, we all didn't think it was salty at all. In fact, it was just as good as the rest of the shrimp dishes we've had so far. The filling was moist with a nice buttery rebound while the outside was crunchy and easy on the grease. Of course, my son was pretty happy with the spring rolls, but he was equally satisfied with his over fav being the BBQ Pork Buns. These were fluffy and light with a considerable amount of filling. Loved the rich colour as well as the balanced salty sweetness. To top it off, the BBQ pork was fairly lean and moist. 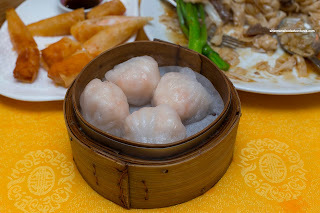 Of course we had to get to the Ha Gau (Shrimp Dumpling) and Siu Mai (Pork & Shrimp Dumpling) eventually. 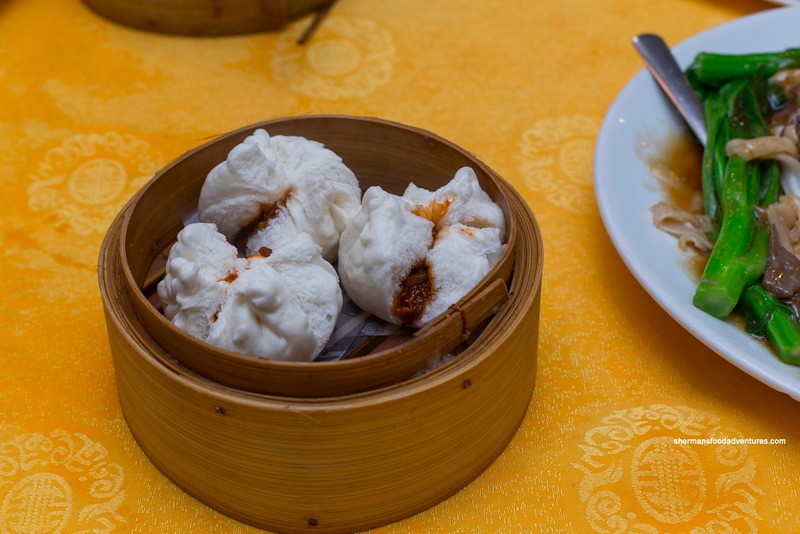 Although the dumpling skin on the ha gau was pretty wet and soft, allowing it to tighten up by waiting a minute or so, it was pretty good. They were fairly large in size and the shrimp filling was on point. It consisted of large pieces along with a bouncy well-seasoned mousse. I thought the flavours were balanced and aromatic. 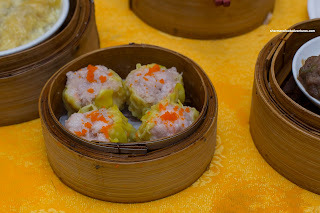 As for the siu mai, they were even better. As evidenced in the picture, they were quite large. Consisting of bouncy pork that was airy and juicy, the dumpling ate very well. There was enough seasoning without being salty where I could taste the natural pork flavour. Nearing the end, we were served the Beef Meatballs which were also large. Sure, please feel free to insert your big ball joke here. Anyways, they were texturally appealing with a moist rebound coupled with a tender meatiness. 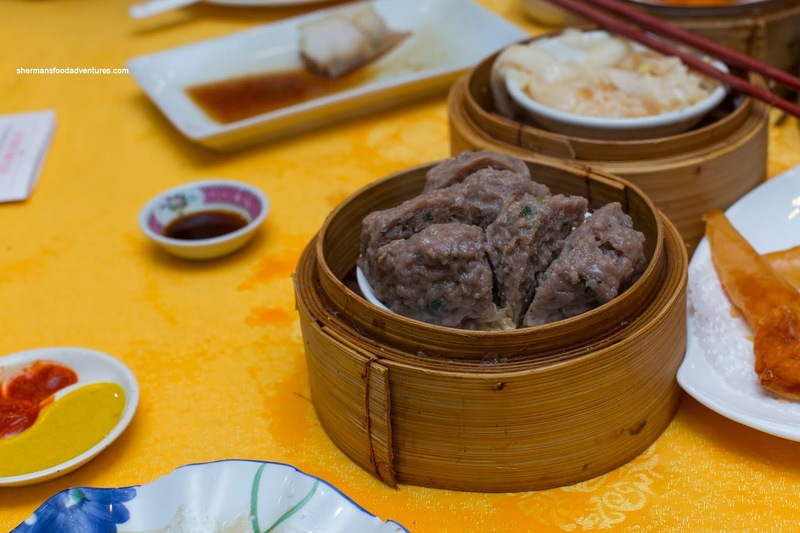 Unlike many other places, they were very conservative with the green onion, which meant the natural meat flavour came through as well as the baking soda. 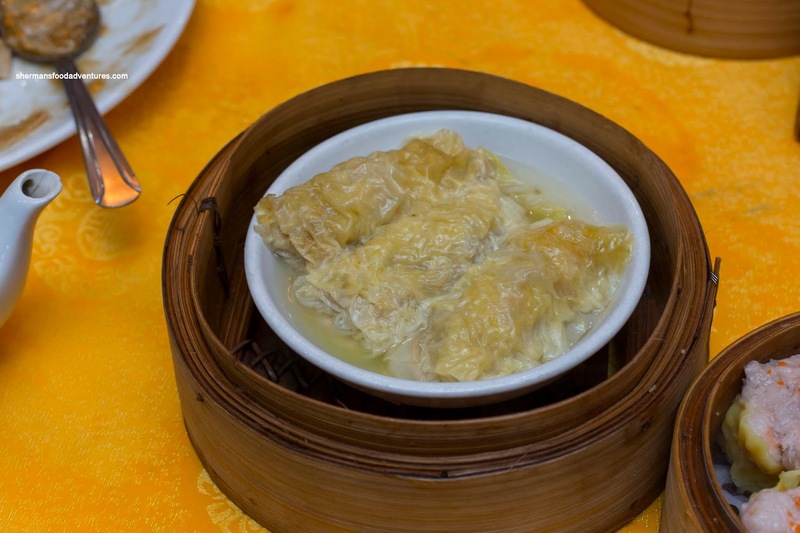 Also unlike other dim sum spots, the Bean Curd Skin Roll was served in consomme rather than the starch-thickened oyster-based sauce. Hence, the flavours were far more subtle. Moreover, the texture of the bean curd skin was less robust where it was delicate with a soft chewiness. 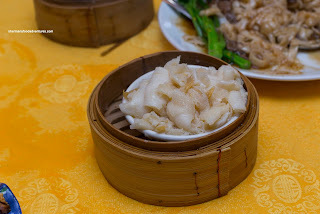 Inside, the pork filling was tender and bouncy while the addition of large strips of bamboo shoots added crunch. 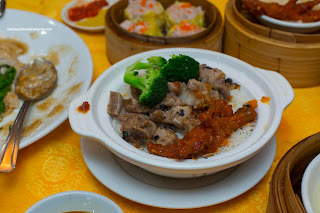 One dish that could've been better was the Sparerib Rice. I thought that the amount of spareribs was meager for rice. Hence, not everyone got enough rib for their bowl of rice. Furthermore, the rice was far too dry and chewy. Normally, that would be a good thing, but is was not even moist after the dousing of sweetened soy. 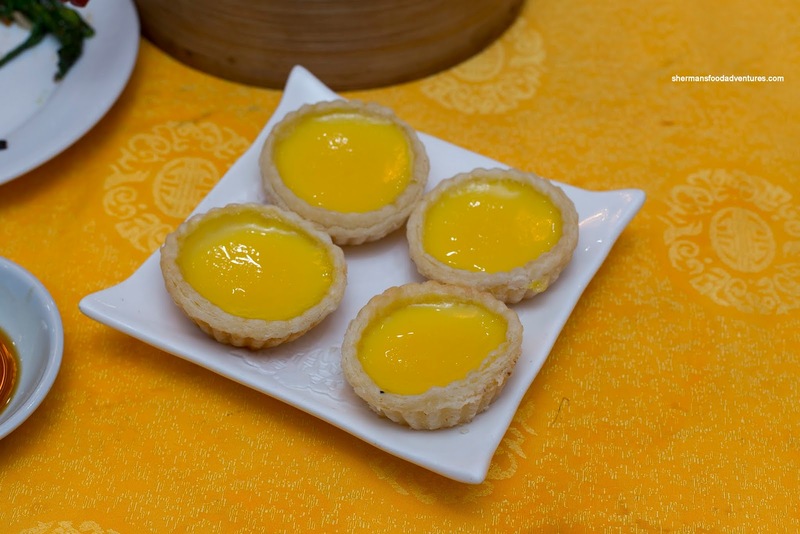 Ending things off, we got the Egg Tarts. These were pretty good with a silky egg custard that was only semi-sweet. Although the tart shell was a bit pale to look it, it was still aromatic from the shortening. Also, it was flaky. "Not bad", is what we thought about the Dim Sum service at Golden Restaurant. Price point wasn't exactly cheap, but still okay. We found the service to be decent as well.